We carry Quilters Dream Batting, we have cottons, polys, blend, and wool. Wide variety of books for quilters! All products for any of the Handi Quilts machines. Fabric kits to make your very own quilt, no need to try and match your own fabric! Quilting magazines for fun filled ideas. Check out our wide range of nations, scissors, rulers, and much more! Fun prints the range from kids, sports, patriotic and much more! Fabric panels range from Novelty prints and books to Reproduction Primitive designs. Need something to give you an idea? check out some patterns! We have all of your Pfaff needs! Many different types of pre-cuts, 5" squares, 10" squares, 2.5" strips and much more! These are machines that have come in on trade. these have been serviced and tested by Bill. These fabrics have a classic look, small all over prints. Knit, Soft, Fuzzy and Gauze Fabrics. 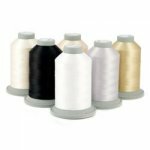 Includes Glide, Glisten and Premo Soft thread.